8:30 a.m., the school day begins. 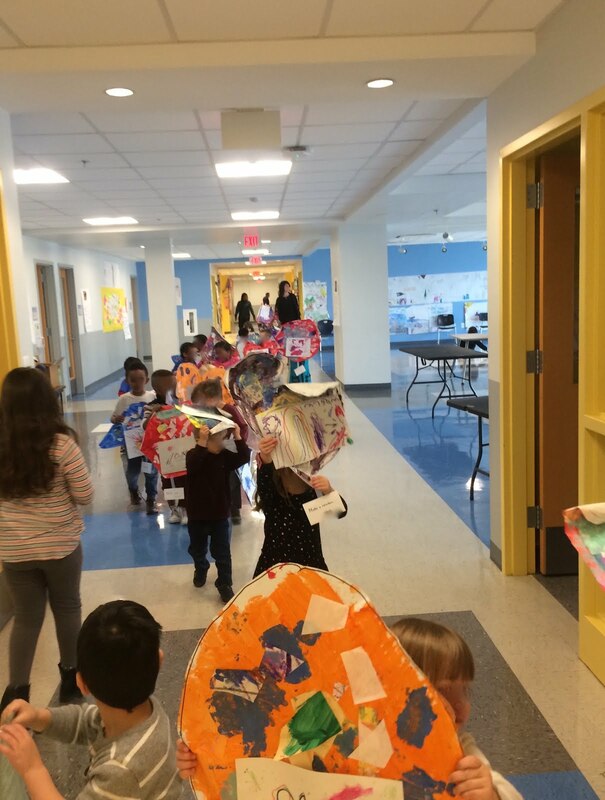 A wave of children coming from the cafeteria, from breakfast, on their way to class. Families arrive with their children in tow. The hallway double-doors just outside my classroom are no longer closed but are opened wide, inviting students to their classrooms. So much happens at these double-doors first thing in the morning. Administrators with walkie-talkies, rushing through the doorway with welcoming expressions on their faces, making way for the stream of children and families, and needing to be somewhere else at exactly that moment in time. A long line of water pours from an open water bottle in a backpack, and another child rushes up to the backpack-wearer, tapping him on the shoulder, "Your water bottle! You need to get paper towels!" Two kindergarteners, sprawled on the floor, near tears, clutching Pokemon binders, and an administrator guiding their negotiation. I hear snippets: "Who had the card first? Who brought the card from home? Are you both happy with the trade? I hear him say he wants his own card back. Let's back this up to the beginning." Laura tarries behind her mother and slips behind the propped open door. Her mother signs her into my class and I say, "Good morning! Where's Laura?" Her mother says, "right here," and turns to look behind, "I mean, right behind me," and she looks all about, "What? Where's Laura?" Stepping back into the hall, she says firmly, "Laura! Where are you?!" Laura giggles, so excited by her trick, and steps out from behind the door. "Oh, child!" laughs her mother. Now, we will have a new daily ritual, I suspect. Yes, the view from the doors provides a lens on the day ahead. The Big Cats are creating wire sculptures for our Phillips art project. How does it bend and move? 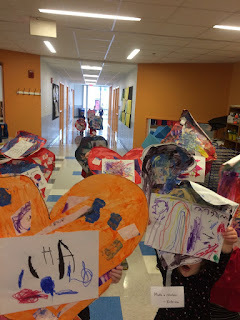 We looked at a video of one of Alexander Calder's moving mobiles. 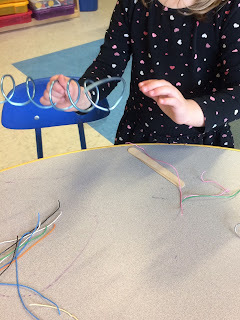 Could we create sculptures that move? 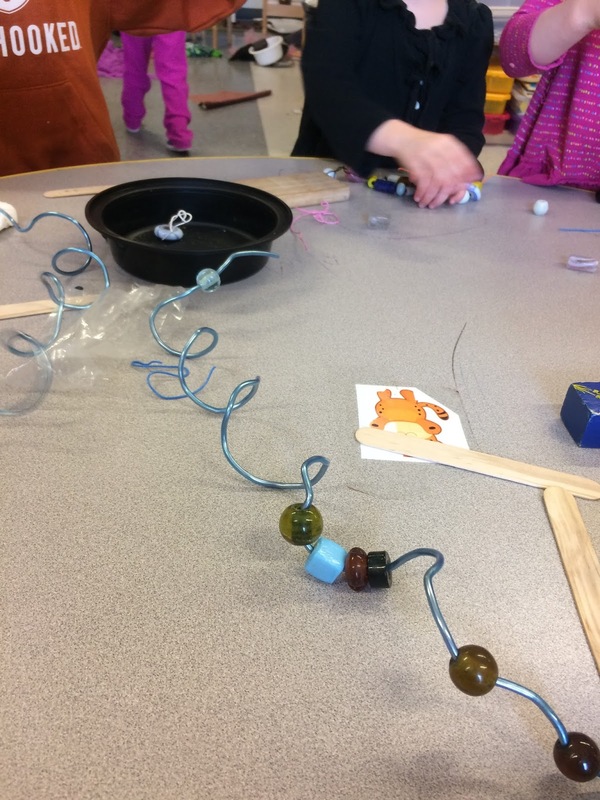 I have set the wire supplies up as an exploratory center, so that the children will learn more about how the materials work before they create their wire sculptures. 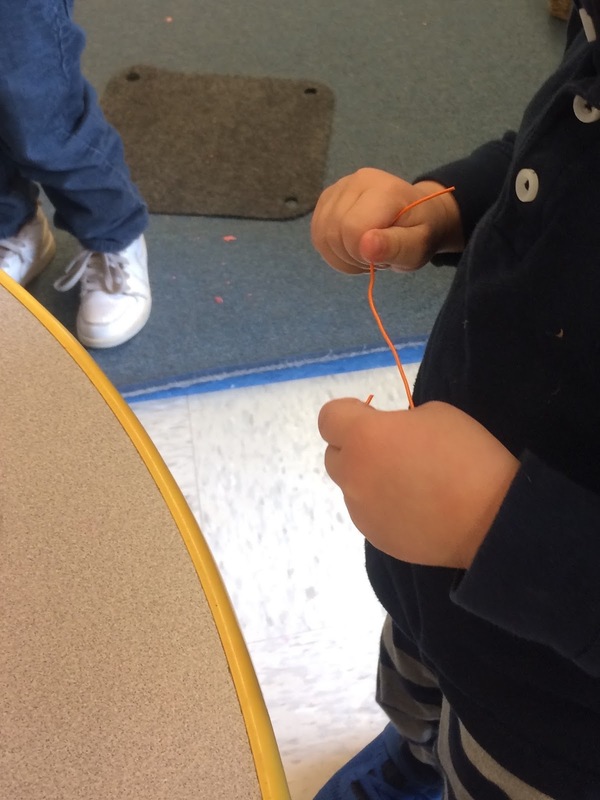 We have three different gauges of wire, and all three types are flexible enough for the preschoolers to manipulate. They quickly figured out that the thicker the wire, the more difficult it is to bend. I love that there are three types of wire - multi-colored fine wire, silver medium wire, and bluish thick wire. 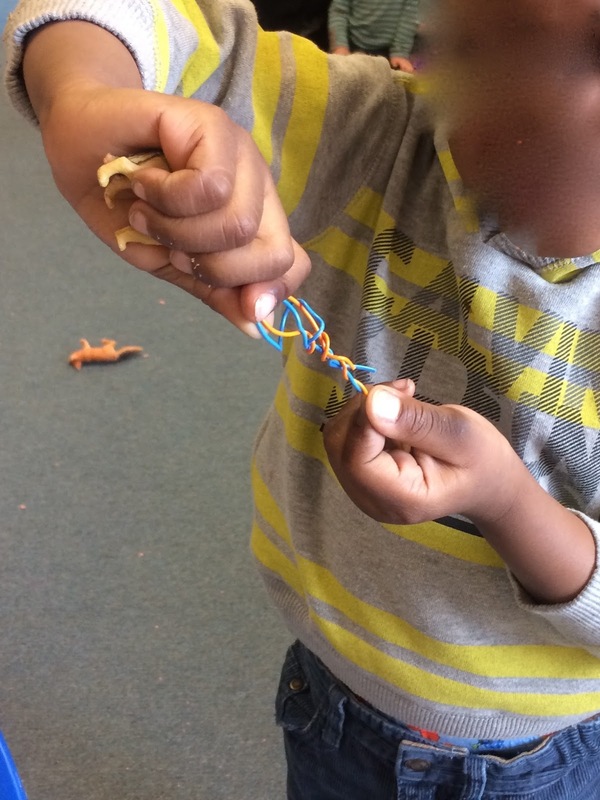 As they practice making loops, bends, knots, connections, and more, preschoolers are also reinforcing their understanding of small, medium, large. What shape will the wire have if we bend it around a block? What happens if we attach two wires together? How can we make the wire curvy? We are also working with a variety of beads. 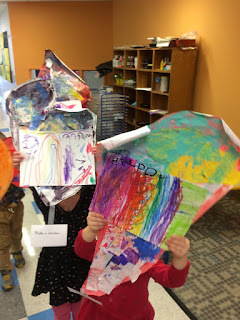 The preschools love to finger these, picking out their favorites. They practice how to connect the beads to the wire. 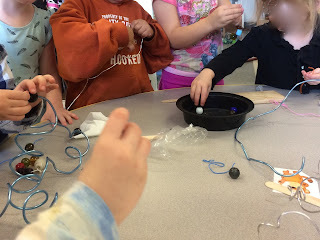 How might we attach the bead so that it wiggles? How can we make it roll up and down the wire? How can we make it stay in a more fixed? It is a kind of slowing down. Investigating requires focus. And fine motor skills. We become better and better at it. Can I play with the wire? Look, I make a balloon! Chains are made out of wire! I want to tie it. This is hanging on it! It is the best kind of learning. Maybe it will move, bend, wiggle? Maybe it will reach high or flow to the side? 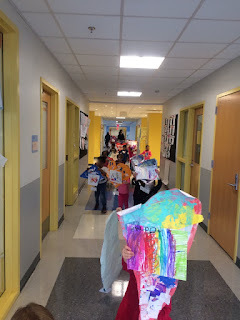 The children will have the flexibility to go any direction they want with the remaining supplies. 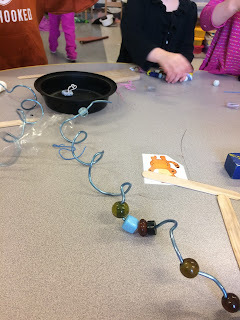 I will encourage the preschoolers to use the heaviest wire at the base and to add lighter wires as they move up. But, preschoolers always amaze me with their ideas and innovations, and I am ready to be surprised and enlightened. I feel certain that their sculptures will have a lot of individuality, that no two will look alike. The children are fascinated by the wire. I am, too. 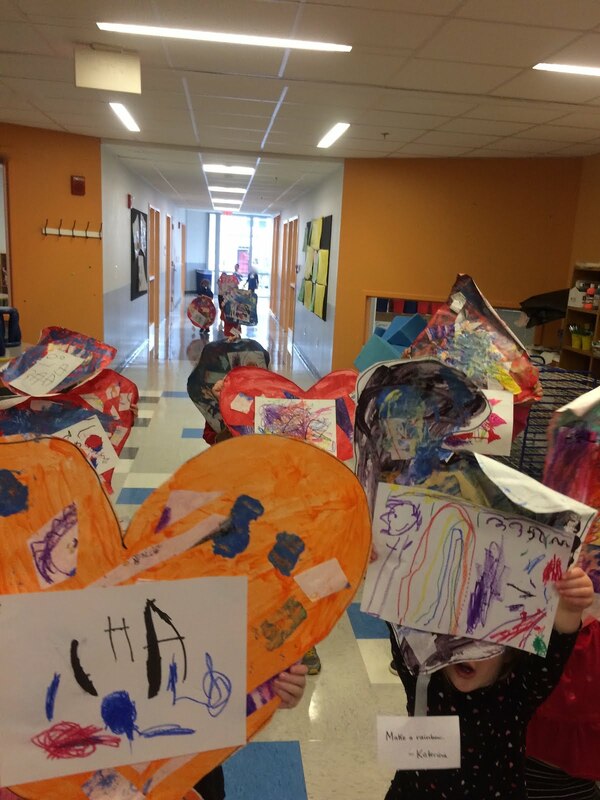 The preschool Big Cats celebrated the completion of their fabulous kindness signs by parading through our school. We shared love with everyone along the way! Let me share a few photos from today's fun. "Ms. Ingram! Jack's opened something he's not supposed to!" Try as I might, lunch in my classroom is a loud, lively, unsettling part of my day. 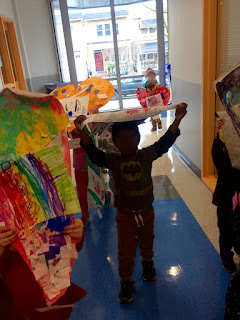 22 preschoolers, four tables, innumerable containers to be opened by hands that are just developing the skills...with three teachers, it can feel as if you are never in the right place at the right time. Lunch is an unending pattern of wiggly bodies moving in their seats, chairs scraping the floor, lunch boxes refusing to open or close properly, children calling out for help in opening things, items falling on the floor, spills that need wiping up, some food getting trashed before it is tasted, children rushing to the bathroom, on and on. I walk over towards that lunch table of preschoolers and what do I find? Jack looking at me wide-eyed and a packet of silica gel sprinkled all over the table - silica gel that was inside the package of one of his lunch foods [seaweed]. Jack said indignantly, "It is part of my lunch but she says it is not!" Jack thought the silica gel was a condiment - it certainly was packaged like a condiment. In very small letters, you can see the words "do not eat" but, guess what, most preschoolers are not readers. 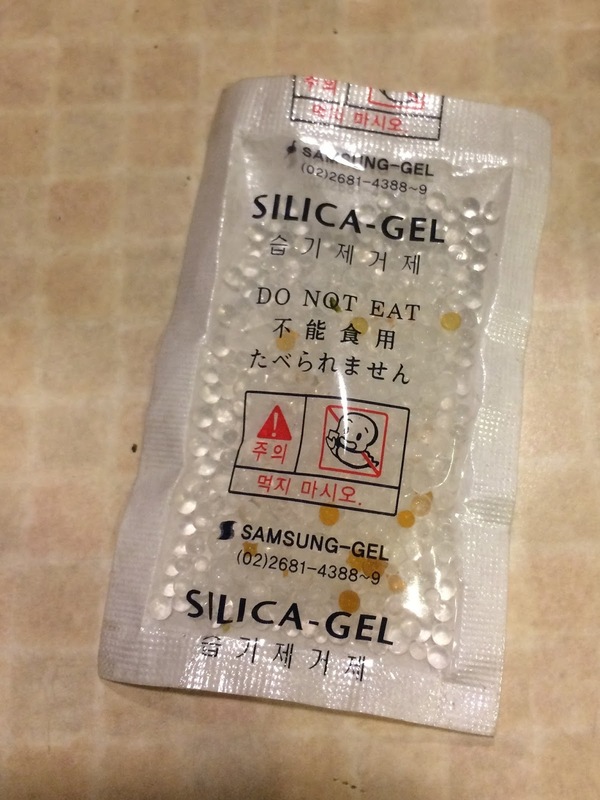 thankfully, the silica gel missed his food and was emptied onto the table and floor; most thankfully, Jack had not eaten any of it. How's a child supposed to know not to eat something like that? How's a teacher supposed to know that this will be included in lunches? Why is it packaged in this inviting way, much like a sugar or a salt? One more gray hair on my head. In recent days, in my local area, one three year old choked to death while eating meatballs at a daycare and one three year old wandered out of her school during nap and was found (and safely returned to school) by a stranger down the street from the school. The outcry is - How did this happen? Where is the supervision? What is wrong with those teachers? I know my school is safe, alert, caring.